Here you can get local advice! Many of our lakes have boat ramps for trailer boats! At most of the Fiskeland slipways there is a dock, as well, but sometimes you have to manage without. In this section we describe some of the slipways available to visiting fishermen. There may be a slipway fee, but if there is there are usually signs at the site. Be sure to park your car and trailer in the places indicated in order not to prevent others from launching their boats. REMEMBER that slipways are primarily intended for launching boats, not canoes. Prepare your boat and trailer for launching away from the slipway so as not to keep others from launching. Tilt the outboard up and back into the water until the surface is just below the trailer’s rear wheel hub. Keeping the hub out of the water will prevent damage to the bearings. Set the handbrake on the trailer and the car. Release the extra safety cleat between the boat and the trailer. Crank the boat out with the cable still attached to the boat. Don’t let go of the crank. If there are two of you, ask your fishing buddy to hold the painter while the boat glides into the water. Release the cable cleat and tie the boat to the dock. Move your car and trailer so as not to keep others from launching their boats. Pay any boat ramp fee BEFORE going out on the lake. The only boat ramp in Lake Edslan. Boatramp in the south-eastern part of Lake Grann. The slipway is located between the road and the lake. NOTE that this is a natural slipway for smaller boats! Boatramp in the southern part of Lake Laxsjön. There is a guest dock as well. - Billingsfors small boat harbor. 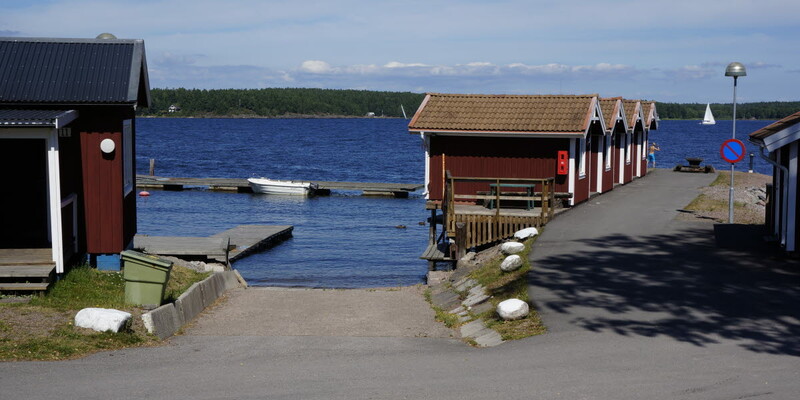 Popular boat ramp in the western side of Lake Laxsjön. This boatramp is located next to the canal between Lakes Lelång and Ärtingen. There is a beach and other facilities. NOTE! Careful navigation is necessary in these lakes due to frequent rocks and shallows. Dock: Summer only. Spring and autumn reserved for other uses. The northernmost boatramp in Lake Råvarpen in Dals Långed / Mustadfors. NOTE! The boatramp is rather steep, but launching smaller boats is seldom a problem. The southernmost boatramp in Lake Svärdlång. 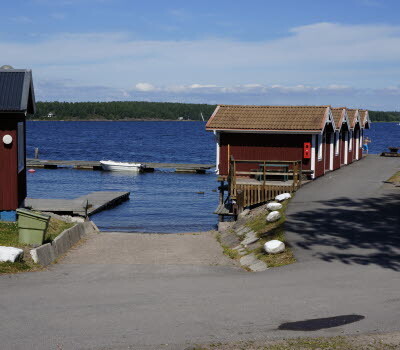 Loviseholm, the only boatramp in the northern part of Lake Södra Kornsjön. There is a restaurant next to the slipway that is open in the summer. Under certain periods there is a toilet next to the slipway. As the boat club also launches its boats here, there may be some waiting time in late May and in June. Therefore the outer ’trolling’ slipway is recommended. - Tössebäcken, at the guest harbor. NOTE! Limited number of parking places. An excellent boatramp next to a large parking area at Marin & Fritid in Åmål. This boatramp has the longest open season of all in Fiskeland. De-icers are sometimes used and there is usually sand and salt available. The southernmost boatramp in Lake Västra Silen. The boatramp is located some hundred metres from the Silverlake Camp. 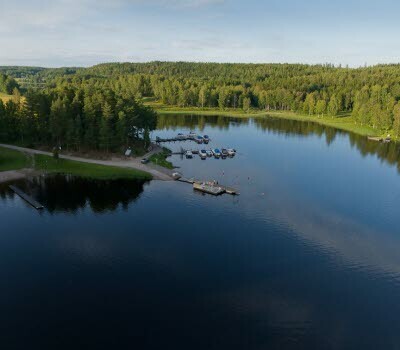 Ånimmen - Lunneviken, the best boatramp in Lake Ånimmen, located in the south-western part.